The Panasonic KV-S2087 departmental document scanner quickly converts order forms, invoices, sales reports, and other large-volume documents in various sizes and thicknesses into digital data. 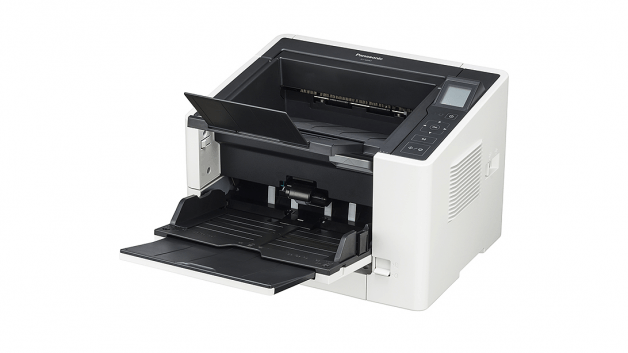 Boasting high-speed scanning of up to 85 pages per minute or 170 images per minute, the KV-S2087 relieves office staff from much of the bothersome work of scanning. Eliminate the need to set up scanning parameters time after time and bring greater efficiency to scanning jobs with a compact design and large capacity automatic document feeder that can hold up to 200 letter size documents in a single run. The KV-S2087 is capable of scanning a wide range of documents ranging from thin paper to thick paper and even passports and cards. The paper path can be easily switched between straight path and U-turn path for quick and easy scanning of a wide range of documents. The KV-S2087 boasts the largest feeder capacity in its class. Up to 200 documents can be set in the feed tray. Since a large number of documents can be scanned continuously, the frequency of setup operation can be reduced for higher work efficiency. The KV-S2087 scanner can easily switch between transport systems via the Paper Exit Direction Selector. The U-turn path is designed for everyday scanning and for thicker or specialty documents, the straight path can be selected. The Digital Imprinter function adds text data to scanned images. The optional Post Imprinter prints text on the back side of the original after the document is scanned. The text is not added to the scanned image making it easy to compare scanned data and the original document for improved accuracy. The long life feed rollers reduce the frequency of roller replacement allowing for a lower total cost of ownership and reduced maintenance requirements.